Several Chabad Rabbis were recently participants at a Public Safety Chaplains Conference in Washington, D.C. The Conference, which invited Chaplains from the U.S. Military, and from federal, state, and county agencies, was held at the CIA Headquarters Complex in Langley, Virginia. The seminars were attended by Incident Commanders, Public Safety, and Military Chaplains. The day-long training session featured a Keynote Address by the Honorable Leon E. Panetta, Director of the CIA. Mr. Panetta's talk touched on his own youth, religious training, and the need for spirituality in the everyday workplace. The director spoke emotionally of the recent episode of a suicide bomber murdering 7 members of the Agency in Afghanistan, and the immediate and effective response of the chaplains. Mr. Panetta was warmly received by the Chaplains, and received a standing ovation at the conclusion of his speech. The chaplains also heard from Major General Karl R. Horst, Commander of U.S. Army Military District of Washington and Joint Force Headquarters. Major General Horst, a graduate of West Point, and an experienced career battle-soldier, emphasized the need for commanders to include chaplaincy in their daily routine. The general related in several episodes, how the chaplains have become a crucial and integral part of the life in the military, especially during battle times. Other featured speakers included Command Chaplain Colonel Steven L. Berry, and chaplains from the CIA Chaplain Unit and several police department, and fire department chaplains. The chaplains toured the CIA Headquarters, and were able to arrange a Mincha Minyan as a first ever Minyan in this location. 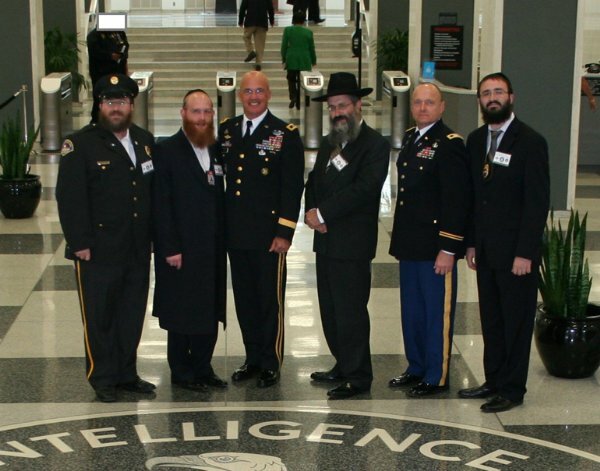 Pictured standing at the CIA Seal in Headquarters are (Left to right), Rabbi Levi Stone-Chaplain of Connecticut Police, Rabbi Sol Lipschitz - Liaison-NYC Agencies, Major General Karl R. Horst, U.S. Army, Rabbi Yosef Carlebach - Chaplain of New Jersey State Police, Chaplain Colonel Steven L. Berry-- U.S. Army, and Rabbi Mendy Carlebach, Chaplain-Port Authority of NY & NJ Police.